Hi. It’s nice to be back here again. Talking about food. Including a recipe. Thanks for your patience. I misplaced my blogging mojo but I seem to have found it again. Phew. Now please pardon me while I jump up on my high horse for a moment. The title of this post is one of the things I hate hearing most when it comes to vegetarian food. “You won’t miss the meat!” I see it in print, I hear it come out of chefs’ mouths and it makes me crazy. I will say it to anyone who asks, I say it in my classes, and I’ve said it here, but the way to approach a switch to the vegetarian diet or even a vegetarian meal is not about substituting. You can’t take a plate with a steak, baked potato, and green beans, and then just swap out the steak for tofu. The vegetarian diet requires a shift in thinking – no longer being so hung up on protein and envisioning your plate differently. For the people who embrace this philosophy, our way of eating can be exhilarating. So many choices! So much delicious food! New cuisines! But the bulk of our country, even though the message is coming through louder and clearer that we need to reduce our meat intake for a variety of reasons, still sees vegetarian food as boring or needs to find a way to substitute for the lack of meat. There are all kinds of fake meat out there and people are choking it down hoping it will taste like what they really want to eat, or it will give them the protein they are terrified they won’t get if they don’t have meat. And here is where I must remind you that I am not trying to convert anyone. As I always say, my own husband eats meat. I just want to help people find their way to a delicious dinner (and breakfast, lunch and a treat). Thud. That was me sliding off my high horse. Now, I don’t use a lot of fake meat. Why? Because I never liked meat. I haven’t had it in 25 years. Meat’s flavor and texture is not something I am trying to replace in my food. This is a reason that I never have in the past, and never will in the future buy a Tofurkey. But sometimes you pause. I’ve been a bit obsessed with making orecchiete with broccoli rabe and sausage recently. Maybe this is my body’s cry for protein. Who knows. But, of course, I have been unable to find broccoli rabe when I need it. So I persevered and bought something I never had before – Field Roast Italian Sausages – and kept it really simple. Good canned tomatoes simmered down with some onion and garlic, sliced rounds of sausage (without their plastic casings) sautéed in a pan, ear-shaped noodles in salty water boiled away, and mozzarella cheese grated. A heavy foil-covered pan went into the oven and 30 minutes later we had a hearty and tasty dinner. It’s good to be back here. Thanks again for all the support. Field roast is sold in links of 4, I only used 3 of them in this dish. 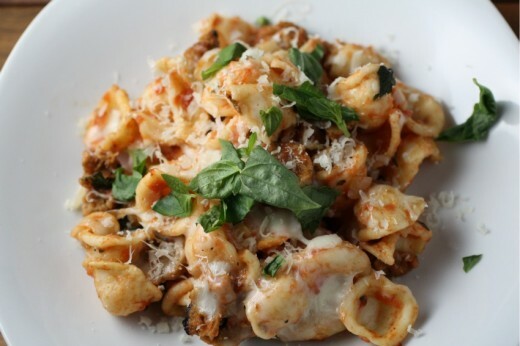 I’ve also made this same dish with a more penne shaped pasta and it worked great as well. A 28-ounce can of tomatoes will be enough sauce for this dish but it is a bit dry. If you like your pasta saucier, add another 14-ounce can. Finally, you may wonder why I would suggest you buy canned whole tomatoes and then purée them rather than just buy puréed tomatoes. I once read that the lesser quality tomatoes end up in diced and puréed cans because you can’t see their imperfections. For this reason, this article said, it’s best to buy the whole ones, so that is what I do. Preheat the oven to 375ºF. Have a 9×13-inch baking dish handy. Place a medium saucepan over medium heat. Drizzle in just enough olive oil to coat the bottom, then add the onion and a large pinch of salt. Stir and allow to cook until starting to soften, about 5 minutes. Add the garlic and the dried herbs. Cook for another 3 minutes. Meanwhile purée the tomatoes. If you have an immersion blender, you can stick the wand directly into the can – just be careful. Otherwise, pour the can into a blender and blend until smooth. (If you want to do neither of those things, you can crush the tomatoes with your hands as you add them to the pot, the sauce will be chunkier.) Carefully pour the tomatoes into the saucepan (they will splatter), give the sauce a good stir, and turn the heat down to medium low. Allow to simmer for 25 minutes, stirring occasionally, until thickened. Set aside. Heat a medium non-stick sauté pan over medium heat. Add the slices of sausage and allow to cook, turning occasionally, until the slices are browned. Set aside. Bring a large pot of salted water to a boil. Pour in the pasta and allow to cook until just shy of al dente. (The pasta will continue to cook once it goes in the oven, so be sure to undercook it a bit.) Drain well and return to the pot. Pour in the sauce and toss to coat well. Stir in the sausage and the basil. Season to taste with salt and pepper. Spoon half of the pasta into the dish. Sprinkle on half the mozzarella. Spoon the other half of of the pasta and top with the remaining cheese. Cover the dish with foil and place in the oven. Bake for 25 minutes, remove the foil and bake for another five minutes. Allow to sit for five minutes or so before serving. I don’t like the fake meat products. I am a vegetarian because I don’t like meat so why would I want to eat something that tastes like it:) There are so many tasty veggie recipes, I never miss the meat anyways:) Love this dish! I wholeheartedly agree on the meat substitutes. That is always one of the first things I get asked when people find out we’re vegetarian. What do you use for a meat sub? Well, that after the protein question. This recipe looks delicious…glad to have you back! As a meat eater (though I like to think of myself as an omnivore — there’s room for meat and non-meat in my diet) I actually really love vegetarian sausage. It’s just a different thing. Vegetarian breakfast sausage sandwiches are a favorite. Meat substitutes freak me out a little bit too. Vegan cheeses are a different story, but Im a little weirded out by the texture of imitation meats. I can’t eat them plain, but once in a while they are great in pasta or pizza – your combo does look amazing! This looks like a terrific dish! I just tried Field Roast veg sausages for the first time last week and we liked them. I am vegetarian, and have a family of meat eaters. We tend to eat mostly veg, with an occasional chicken or beef meal for them. They are happy eating vegetarian dishes and enjoy the variety, which I definitely appreciate. I’ve recently toyed with the idea of going vegetarian more than ever. Recently certain meats have just not been sitting well with me and I feel less and less hungry for them. I”m less concerned about what I’d be giving up, and more interested in discovering how it would make me feel. Thanks for getting on your high horse, Dana! Good inspiration. That looks like a perfect fall dish! I read the Field Roast website but couldn’t find the ingredients in the sausages. What do they put in them? this looks oh so yummy!! aren’t those Field Roast veggie meats so good? I love love love them with my eggs. The spicy one I cannot get enough of. So yes, I am SO with you on this recipe. Smart thinking. I’m not a vegetarian because I like to eat meat now and then, but I looooove vegetables and sort of hate meat substitutes (and people who think providing a meat substitute and no veggies is vegetarian friendly, well I don’t hate them, I just plot on ways to bring my own veggies). I am hoping you have a tip for orecchiete – every time I boil them a bunch stick end up nesting and not cooking well – could it be the brand (TJs) or not enough water or ??? 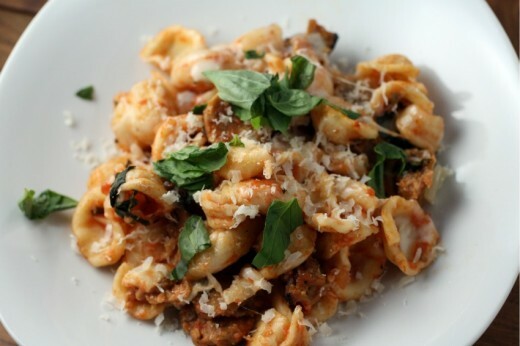 I’m making this tonight–but with broccoli rabe instead of sausage! I’ve been getting stalks and stalks of it from my CSA. I’m not big on the fake meat either, but I am actually a huge fan of Field Roast sausages. I consider them as a kind of healthier convenience food, since I don’t use a lot of packaged/prepared items. You know, I think it’s because I’ve never tried to replace meat and really enjoy tofu and tempeh for their own flavors and textures, that I don’t miss meat at all. I never ever craved meat the way most carnivores do and so maybe I also just never liked it all that much to begin with? That being said. The only dish my mother made that I really truly loved with pasta with sausage and broccoli rabe. She bought the broccoli rabe already cooked in garlic and olive oil from our local Italian deli and the sausage was from there as well…and it really is a great meal. I’ve been wanting to try those Field Roast sausages since I’ve heard REALLY good things about them from omnis and vegetarians alike…thanks for giving me the reason to! I completely agree Dana- my fiance is forever worrying about missing protein and my protein intake, but as I’ve pointed out time and time again, my body seems to like what its been doing for the last 4 years, and since I’m not really trying to build muscle like he is, I have to gently assure him that I probably don’t need 60+ grams of protein a day. As you say, its a shift in thinking and since he never complains about the actual food, he clearly likes eating it either way! Glad you’re getting back in a groove- hope all is going well at the Book Larder! any food that tries to replace or be something that it isn’t ticks me off to be honest. Chef’s should jolly well know that the creativity in a dish generally revolves around the vegetables on the plate, much less the “meat” part. Some of the best dishes I have ever had eating out were vegetarian and weren’t trying to be either vegetarian or a “meat substitute”. I cook that way at home too. My biggest pet-peeve with this is the raw food books – everything is a raw substitute for something that is well known and cooked (I think every raw book has lasagne in it..). OK, off my high horse now too. Dish looks great! Perfect for these cold fall days. I never totally understood the fake meat thing either when I was a vegetarian. If I don’t want to eat meat and don’t want the taste of meat, why would I want a (usually) heavily processed product that tastes like it? That being said, field roast is supposed to be pretty good and the recipe looks lovely. Perfect for this time of year. So nice to see you the other day and catch up…looking forward to more of that. I never understand the whole meat substitute thing either – why have fake meat when you can have lovely real vegetables and legumes etc. That being said I do sometimes use ground round in chili or pasta sauce. And this looks delicious and I need to look out for field roast sausages (we love sausages but don’t love all the things that go in meat ones). What a delicious dish, I frequently cook vegetarian for myself but my kids and husband they love their meat. It’s a lot of work sometimes to prepare two dish for a meal. I would even love this without the veggie sausage. It is loaded with flavour!!!! Even though I’m not a vegetarian, I HATE it when people try to pass off vegetarian fare as a sub for meat. Why not appreciate it for its own merit? I could spend a day on my high horse regarding fake meat. But, sometimes a pre-made, frozen, veggie burger just works. So, this makes perfect sense to me. Looks delicious too!